I knew from the beginning that flowers weren't something I wanted to splurge on. They can be really (really!) expensive, and I figured that small, simple bouquets for me and the bridesmaids would be easy enough to throw together. 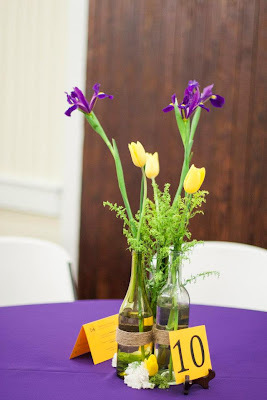 I researched options for wholesale flowers and ended up ordering three different blooms from Sam's Club two weeks before the wedding - 100 yellow tulips, 100 purple irises, 150 white carnations, and eight bunches of assorted filler flowers. Grand total: $333.32. The flowers arrived on Friday, the day before the wedding. They looked great, except for the irises - the blooms were still closed, but we hoped they'd open overnight. 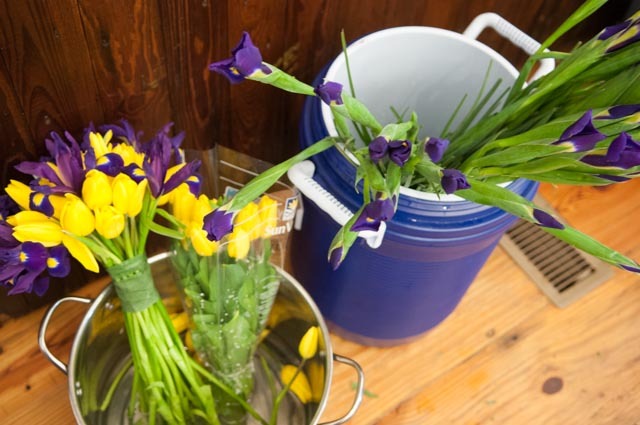 We stuck them in buckets on our porch with water and flower food and crossed our fingers, but to no avail. The next morning they were still closed. Doh! At least the buds were pretty. At any rate, it wasn't something I was going to freak out about. I moved on. I had originally and ambitiously planned to make the bouquets myself, but as the wedding neared and I was becoming overwhelmed, I texted my friend Rachel. She had agreed to serve as our Stage Manager - helping coordinate all the day-of details while Nathan and I were busy getting married - and I had a feeling she could save me. Thus, the morning of the wedding, Rachel was sitting at a table, assembling six bouquets and assorted corsages, and then finding creative ways to use the leftover flowers (we had quite a few leftovers). 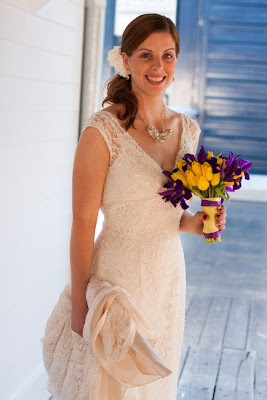 I had an idea for the bouquets, but it didn't quite work, so I gave Rachel free reign in the design department - good thing, too, because she did a beautiful job. 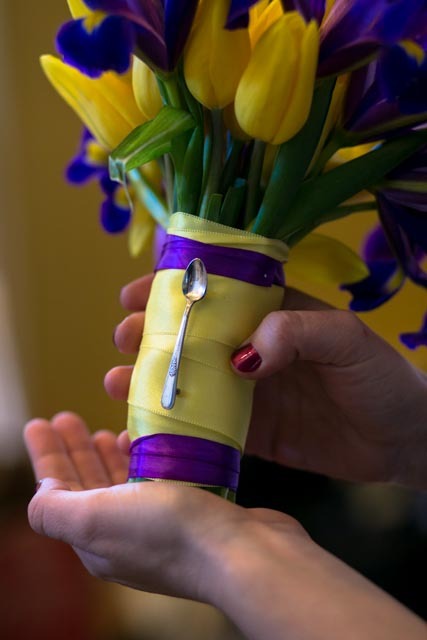 Did I mention that she and Amy, one of my bridesmaids, also managed to open the iris buds by hand? Yes, my friends are amazing. 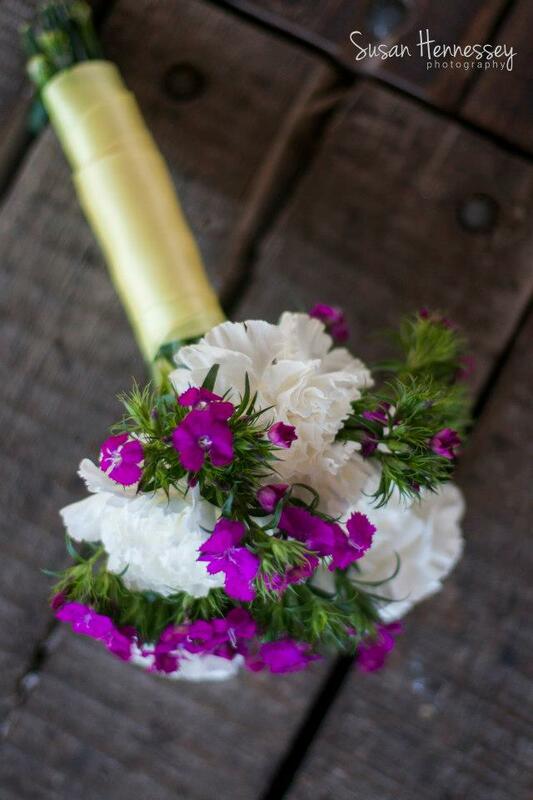 I want to say it was easy to DIY our bouquets, but that's only because I wasn't the one who actually made them. I will say that if you have a talented friend willing to do you a huge favor, the wholesale, DIY route is worth it. A few weeks before the wedding, Nathan and I lured some friends to our house for a centerpiece making party. We took three bottles of different sizes and colors (yellows and greens, mostly) and bound them together with thick twine. It took the four of us maybe an hour to put together fifteen of them, and that was with breaks for popcorn and hanging out. 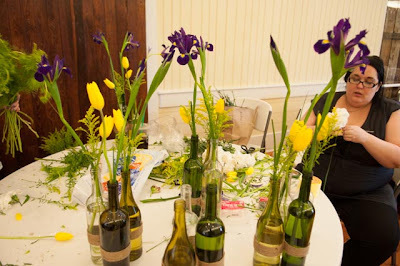 The morning of the wedding, Amy was in charge of putting the flowers into the bottles and setting them out on the tables. Again, my friends went above and beyond - I assumed she'd pop the flowers in and be done with it, but I should have known better. 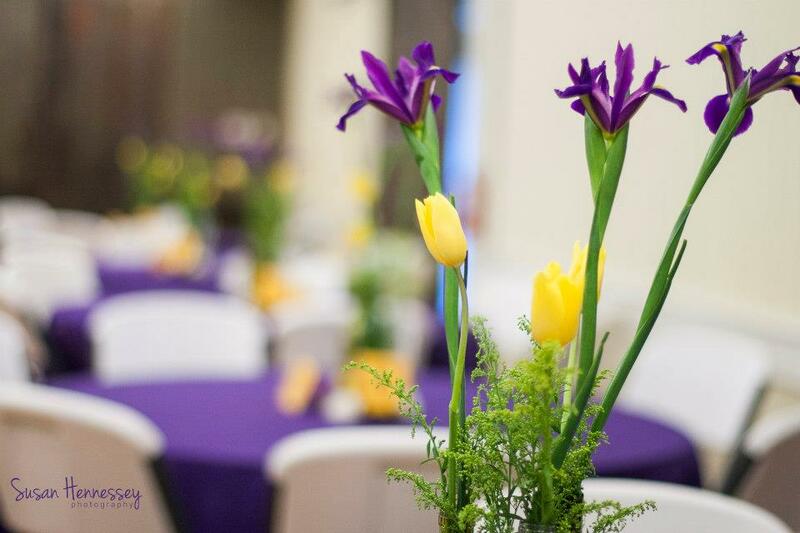 Amy carefully chose each flower, helped open the irises, and then found ways to use extra carnations at the base of each centerpiece. End result: gorgeous. Also: so cheap. We used the same flowers I'd ordered from Sam's Club, the bottles were free (well, after we drank the wine) and we probably spent about ten dollars on twine. It was magical. We gave our guests two wedding favors. 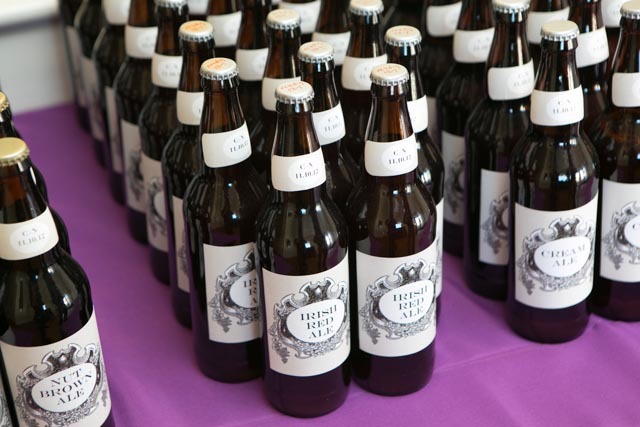 The first one was a 22 ounce bottle of homebrew. The second favor doubled as our seating cards. I really loved the idea of plantable cards and found some on Etsy that were decently priced. Nathan, however, thought we could just order seeded paper and make the cards ourselves. Okay, I said, and ordered twelve sheets of light brown seeded paper from Botanical PaperWorks. Total: $37.10. The paper was great - finding a way to print on the paper was less awesome. I spent a ton of time making a lovely design, only to realize that none of the printers I had access to could handle the width of the seeded paper. After a few frustrating days of trying to find a solution, I decided to hand stamp each card and write the names and table numbers myself. 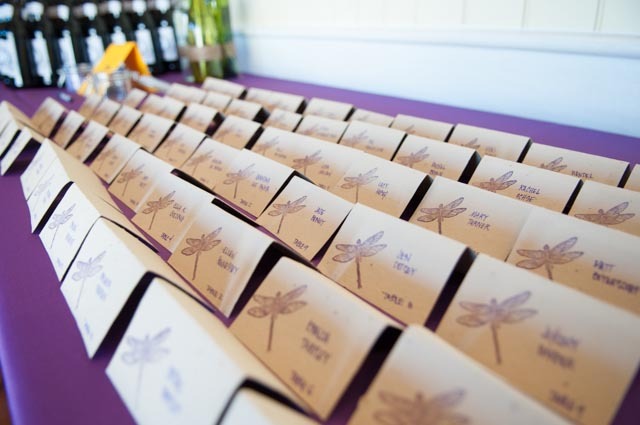 The stamping was easy (I wanted a bee but settled for a dragonfly) and Amy (who has nicer handwriting than me) volunteered to inscribe them the night before the wedding. Hopefully, everyone saved their cards and planted them when they got home, and that they are now enjoying beautiful wildflowers compliments of my sweat and tears. And if you, Dear Reader, were a guest and you do not have wildflowers blooming in your yard this spring, I will be terribly, terribly disappointed. Just warning you. And that concludes the story behind our flowers and favors! Did you or would you DIY either of these things? Do you have wisdom for sharing, or horror stories for scaring? I would, as always, love to hear them in the comments.